Skating Safe Body Protection Package. The Skating Safe Pads (Hip, Spine, Knee and Elbow) are thin and light weight. They are anatomically shaped, and have a very strong and extremely flexible vinyl covering. 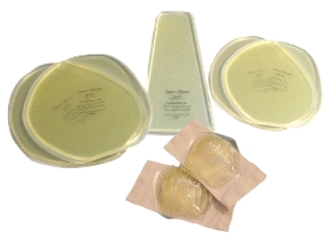 These pads are expected to last for years of daily use and abuse. Best worn under two pair of tights or tights with leggings next to skin. Practically unnoticeable, this has made them very popular among young skaters, who want the protection, but do not like the bulky appearance that other hip pads have. The material used to construct Skating Safe Fall Protection Pads is unsurpassed in its impact energy absorbing characteristics. Hip pads protect your hips from falls associated with ice skating. Knee pads protect your entire knee area, spine pads protect your tailbone, and the molded elbow pads protect the entire elbow area. The unique design offers comprehensive protection to bony prominences. Two retention sleeves are included in the package. Choose your size from small (ages 7-14 years), Medium (Adult Small - Adult Medium) or Large (Adult Large - Adult XXL).